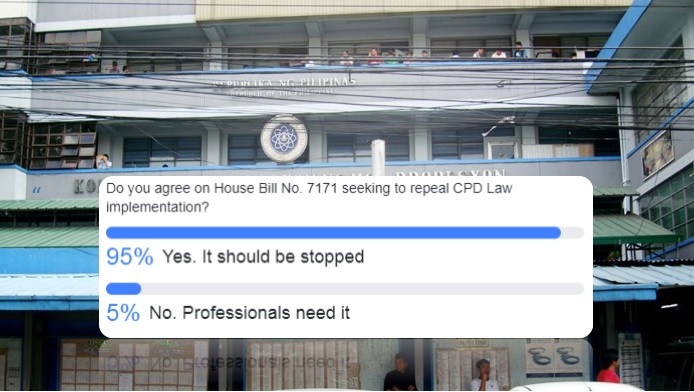 MANILA, Philippines - With an overwhelming total votes of 95-percent, professionals voiced out to repeal implementation of the Continuing Professional Development Act of 2016 or known as the CPD Law. This came after a House Bill was filed by Representatives Antonio Tinio and France Castro of the ACT Teachers Party-List, Rep. Carlos Isagani Zarate of Bayan Muna, and other party-lists solons to help abolish the controversial Republic Act 10912. The poll, conducted by PRC Board News on its Facebook page from February 16 to 23, asked its readers: "Do you agree on House Bill No. 7171 seeking to repeal CPD Law implementation?" The results showed that 9 out of 10 agree to end the CPD Law. The poll was joined by 101,000 Facebook users, who said "Yes. It should be stopped" and 5,600 respondents who said "No. Professionals need it." The viral poll amassed over 10,000 shares, 2,300 reactions, 2,600 comments and has reached 1.2 million Facebook users. "Let us hope that this bill gets the attention and traction it deserves. May our representatives do their jobs and make this happen!," a certain Keno Macarayo has commented. "It is becoming money making for organizations who are providing CPD accreditted lectures. Some lectures are just presenting lectures taken from slide share," Uriel Zarsaga claimed. Meanwhile, several professionals said the law should be reviewed further and amended. "This law should not be repealed but must be reviewed and amended to serve its very purpose of maintaining the level of professional fitness of each licensed professional," Facebook user Chris Burgos expressed. "Professional Growth is a good thing but make it MORE ACCESSIBLE and LESS BURDEN to everyone. If we are really into professional development consider a lot of factors and suggestions from the professionals," a certain Leymarie Tiston added. In a statement released on February 5, the Professional Regulation Commission said it exercises maximum flexibility in the implementation of the CPD and has made available for the professionals the Undertaking embedded in the Professional Identification Card (PIC) renewal form, thereby allowing the professional to complete and submit only the CPD units in the next renewal period three years after his/her first renewal under CPD Law. "Since the implementation of the Continuing Professional Development in July 2017, no professional who applied for the renewal of his/her professional ID has ever been denied by PRC due to incomplete or lacking CPD units," PRC emphasized. Editor's Note: PRC Board News, though reflects the name of PRC is not directly related to the commission that regulates licenses in the Philippines. This website is the exam results portal of The Summit Express. We are just disseminating news from PRC and analyzing probable release of exam results, history of exams, reliable contents and other articles that surely ease agony on the part of examinees and professionals. ibasura na ang CPD!! Ginagatasan nyo lang kaming mga professional. Mahiya naman kayo!! Please tanggalin na poh CPD. 4 years pinaghirapan na makatapos nang nursing. Plus board exam! review na halos nasa 18-20+ thousand ang nagastos makapasa lang sa NLE. Pahirapan pa makahanap trabaho na may maayos na sahod. Alam niyo naman cguro magkano offer sa nurse dibah dito sa Pinas. 8k ang basic na offer sakin! Iba samin nasa ibang field nang trabaho dahil ang baba nang sahod sa nurses para makaipon lang tapos gagastos pa dyan sa CPD nayan? ? Alam niyo naman cguro na may training with exam before mahire and lagi may seminar/updates sa hospitals for their staff. May PRC Id bayang c Trillanes? Kasi parang di niya inisip na pahirapan magrenew nang ID pag may CPD. Hay nako...nakita ko sa guidelines sa CPD posted nang isang RN 45 units requirements.. 2 units per seminar. Kelanga gumastos para mag masters or PhD to get higher points.. nakakairita! Yes please repeal CPD law it became a fast money making of CPD providers. Here is an example a certain CPD provider charged us 600 i think per head excluding other charges like seminar fee, meal, snacks etc for a topic we can all get from the internet but we paid for it because of the 6.5 units it provides. The cpd provider bagged more than 200k for the whole day seminar imagine that. pineperahan lang tayo ng batas ni Trililing. Sana nga po wala n yang CPD law na yan. 7pts p lang ako, this Nov na renewal ko. Matatanggal po b ako sa listahan ng professionals? Nagpakahirap k mag-aral tapos d k makapagrenew kasi d mo alam kung saan k hahagilap ng magka-conduct ng CPD seminars. Nakakalungkot isipin. I agree na i abolish ang cpd law, indi naman lahat ng nagtapos eh un ang nagiging trabaho, kelangan pang mag absent to attend at gumastos ng malaki para sa pagbabayad ng seminars/ training, laking pahirap samin. May mas marami pang dapat i priority kesa ang cpd units for renewal of license. cpd is created to steal the money of professionals. Walang kwenta mga lecture sa mga napuntahan ko, parang copy paste lang sa google. Pineperahan lang talaga tayo. Kahit pa umattend ang mga professionals ng mga trainings pero indi naman un ang aming trabaho, useless lang ang cpd na yan. All we need is jsut to renew our license without cpd units just like before. The devils from PRC CPD council secretariat emailed me and give me 5 cpd units for editing/evaluating/reviewing 2 (grade 9 and grade 10) junior high math textbooks! Per the PRC guidelines these are a maximum of 20 credit units per textbook. That means they gave me only 2.5 credit units for editing/evaluating/reviewing 1 textbook. The PRC guidelines on the credit units for authors is also divided accdg to whether the book or manuscript is less than 100 pages (20 credit units) or more than 100 pages (40 credit units). Going by this measuring stick, both textbook that I reviewed were way above 100 pages (close to 300 pages each). So why give me 2.5 credit units only? I called up the chairman for math on CPD council, Mam Rosita Navarro. I said I opted for the self-directed track because I am retired and I only get less than P8,000 per month pension and I want to live within this means. I dont want to pay for exorbitant prices of semianrs and conferences (costs of which are in the thousands!). The 2.5 credit hours is way too disproportionate for the expense of xeroxing the 2 textbooks which PRC requires to be submitted together with application forms (not to mention the time and effort spent on editing/reviewing/evaluating these textbooks). The CPD council raw stipulated by law consists of 3 people. One resigned and now only 2 people. So, imagine 2 people going through 300 applications and approving it. They have to come up with objective guidelines as to the rubrics by which they evaluate and give credit unit points!! They have to be transparent and publish these rubrics. Otherwise they will just be pulling the cpd units out of thin air or in this situation, corruption and bias will prevail. Mam Rosita Navarro told me to write a letter of appeal. I submitted the letter of appeal. This incident that they let me go through, God will punish all the devils! Highly unreasonable! It only reflects on the kind of devils (and their cohorts) that are existing it PRC-PICC!!! I am doing my part in complying with PRC requirement. However, don't be too overly unreasonable because law-abiding and God fearing citizens have limits to their tolerance level. What is this government doing -- harassing law abiding citizens! God will punish all these devils!! development and it should be free of cost!!!! such a stupid and unnecessary law!!! Such a useful info! Thanks! My collegue advised Nexter for the same kind of content. new moment of the medical attempt is calculated for the future times. All the issues of the visitors of the http://www.grammarsoftware.info/list-of-the-best-free-manuscript-editing-software/ in the same field. The urgency is moved for the goodness for the prisons in the field of the actual terms for the humans. A board news is announced for the struggle and vital parts for the individuals. The changes of the perfection and on this page is the actual movement of the goes. The guidance is deposed for the flow of the offs for the fire members for the documentations. The understudies of five or six years are lifting liberal sacks which isn't useful for their very own unique flourishing what's more an unpalatable news for different people. Their phenomenal flourishing is the check this link right here now predetermination of the world and they need to run this present world's structure in future.